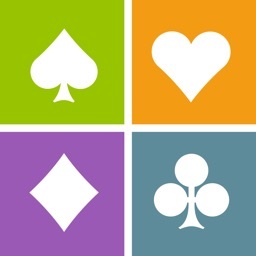 Everything you could possibly want from a Bridge App. 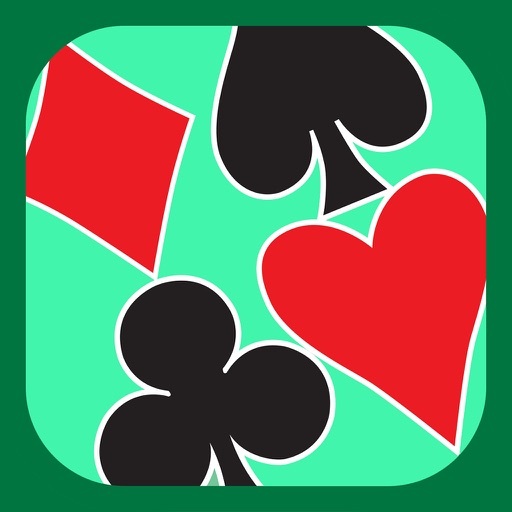 Play Rubber, Chicago, Teams of Four and Duplicate Bridge, with no interaction with other players and minimal reliance on an Internet connection. One of the World’s top Bridge Artificial Intelligence engines, wrapped in a user-friendly interface. 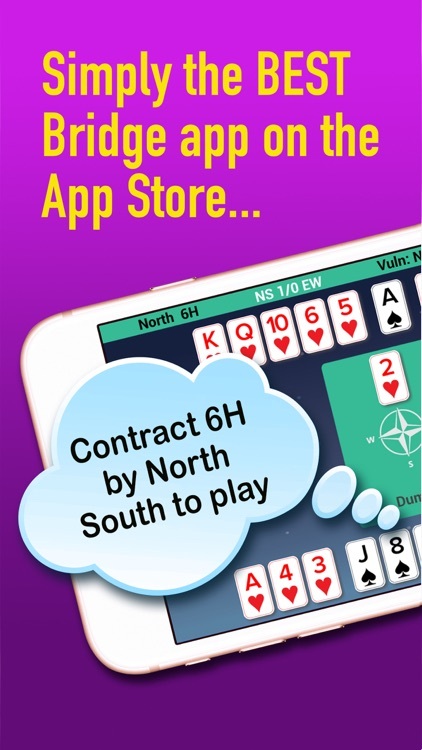 FREE to download and sample all the features, this App will challenge the most experienced players, while the ‘Assist’ mode will teach and guide the novice. 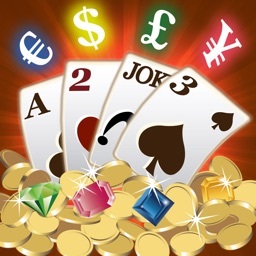 40,000+ users playing 120,000+ hands daily, and universal 5* reviews (read them!!) show that we must be doing something right! "Simply Outstanding" Justin & Barbara Hackett - current English and German Internationals. •	You ONLY play on your own, (always as South) with the Bridge Engine playing as your partner North and also opponents East/West. 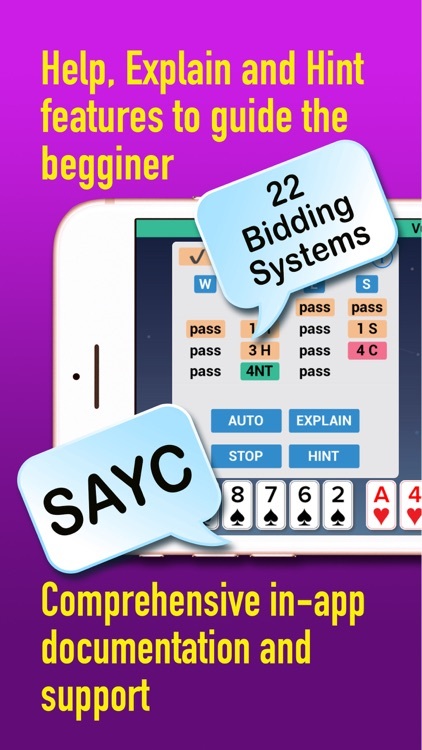 •	Support for SAYC, Acol, 2/1, Precision Club and Standard American / Danish / French / German / Italian / Swiss bidding systems, at basic, intermediate and advanced levels. 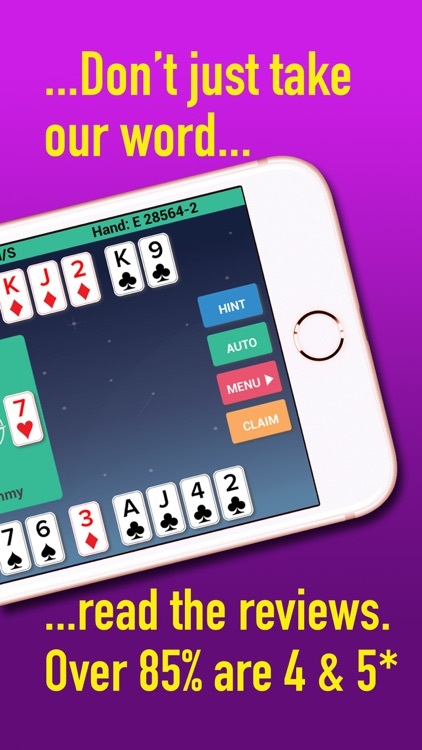 •	Be free from internet connections - play whenever you want, wherever you want. 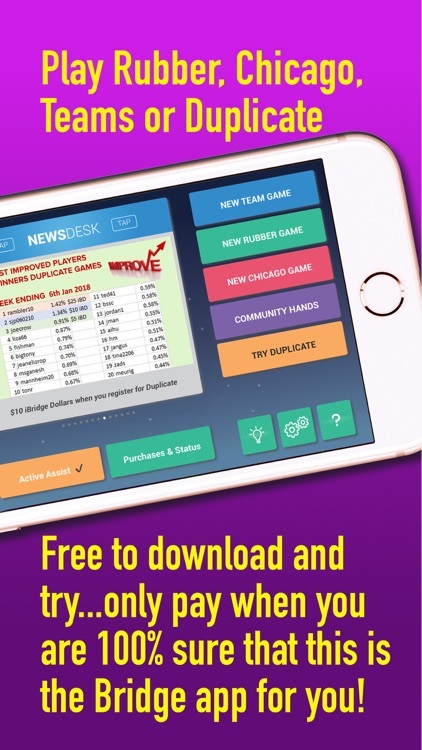 •	Take part in Duplicate competitions - you will still play on your own, but you can compare your scores with other users from around the world, allowing you to monitor your own progress with your personal performance rating. 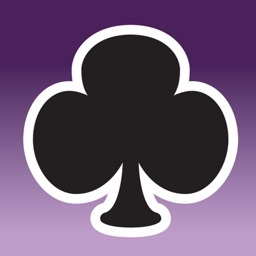 •	NEW FEATURE - our improved analytics enable you to review the bidding and card-by-card play of all competitors in a Duplicate game. •	NEW FEATURE - Daily ‘Community Hands’. The same hands available to all users. Compare your score. 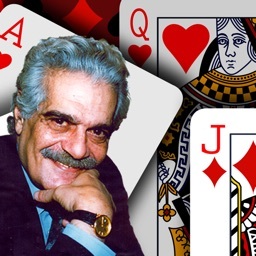 Ideal introduction to the concept of Duplicate bridge. •	Alter My System - this module enables you to tweak, adjust, or completely redesign your bidding system to behave exactly as you would like it. Save and share your bidding system with others (in-app purchase required). 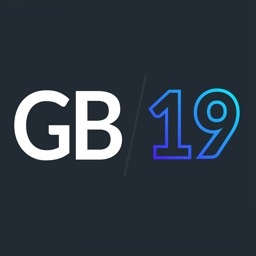 •	Comprehensive in-app documentation and video presentations to help you use and make the most out of this all-encompassing app. 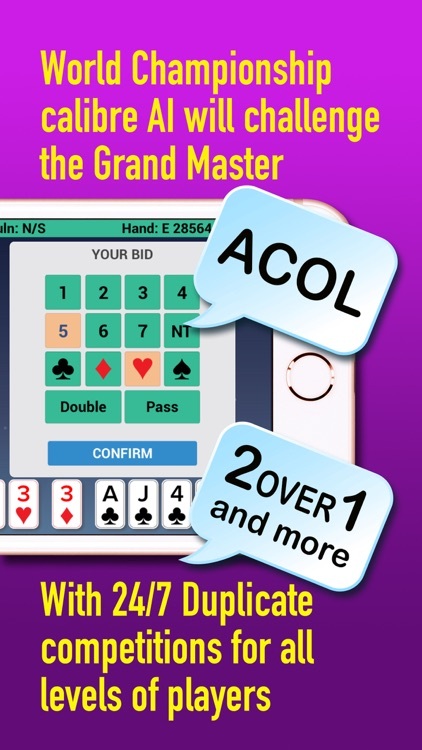 •	FREE to download and evaluate - get 16 trial hands, PLUS Free ‘Community Hands’ EVERY DAY. •	Claim your $10 FREE iBridge Dollars to get you started in the Duplicate competitions.